New, hundredth gram resolution and four different weighing modes. Platform Size 3.1" x 2.5"
Scale Size 6" x 3.25" x 0.75"
Man, This Thing Is Tiny! You won't have to worry about this scale taking up space. It's six inches long, and less than an inch thick! 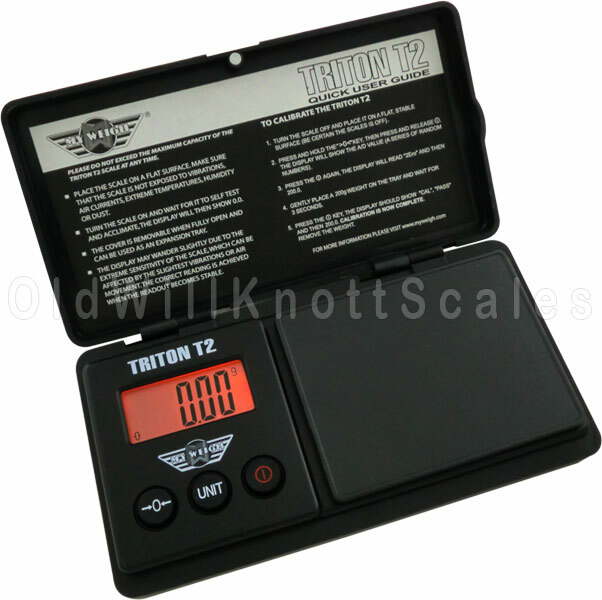 You can take this scale pretty much anywhere ya want...stick it in a pack, purse, or in your shirt pocket. Easy Calibration This digital pocket scale comes factory calibrated and ready to use. Just in case ya need to calibrate it, the T2-200 comes with easy to follow calibration instructions. You'll just need to pick up two 100 gram calibration weights to get the job done. The Protective Cover Does Double Duty! This tiny scale's hard protective cover is great for keeping your scale safe when ya aren't using it...and it doubles as a nice expansion tray, increasing the area ya have to weigh your stuff on. Since it has edges, you can weigh all kinds of things that would normally fall right off the platform. 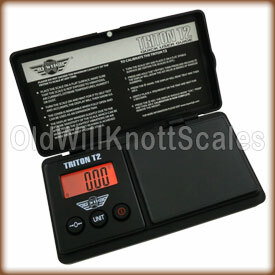 Tare Feature The tare button on the front of this digital scale can be pressed to "zero out" the weight on the scale. You can then add more weight, and the display will only show the weight of the items you're adding. This sure is useful when ya want to use the cover as an expansion tray to weigh your things, or if ya want to get separate weights of multiple items. It Remembers The Last Unit Ya Used If your application needs weights in the same unit of measurement, (like ounces for instance), it can be a real pain if your scale always turns on ready to weigh in grams. It's a good thing the Triton T2 turns on displaying the unit of measurement you were using when ya turned it off. Auto-Off Feature If ya have ever had the batteries in something run out because you forgot to turn it off, you'll realize what a blessing this feature is. The Triton T2 200 will automatically turn off after a few moments of inactivity, saving battery power and money. Great little scales, very accurate. I'm really happy with the purchase. I race professional pinewood derby cars at the National Pinewood Derby Racing League (NPWDRL) and these were perfect for getting the weight in my cars adjusted just right. When getting these don't forget the two 100 gram calibration weights. They can't be calibrated with just one weight. One of the scales was right on out of the box and the other two were off by .02 grams, not much at all but I needed them to be calibrated to one another. You won't go wrong with these. They're easy to read, calibrate and use. I had bout a scale from a company that used to sell books online, but now sells everything and I had to return it. I need a scale that will weigh accurately to the the 100th of a gramm for keeping the chemicals balanced in my fish tank. Since my tanks are small I am working with small amounts of salts and buffers. I called and spoke to Brandon, and he suggested this scale. I ordered it on Friday, it arrived the following Monday! Scale is very good quality, it measures accurately. It alsocame with a VibraKill pad, and was packed well. Five Stars for the Scale and Five Stars for the Comapny. Old Will Rocks! Received unit as told I would. Found scale to be easy to use and calibrate. Very pleased with service and product. Thanks!! I managed to pick up this scale on one of the sales of the day, so I got it for $20 plus shipping. It was sent out on Friday and in my mailbox on Monday when I got home from work. I ordered some things online from Kentucky and it took their company a week to get it to me. Way to keep up the good service OLD WILL KNOTT! This is perfect. Lightweight, easy to use, and accurate. It's everything I needed.